The British Blue Cattle Society Premier Breeder & Premier Exhibitor Awards, which were previously offered at the Royal Show, are now be rotated around key, regional shows. We were delighted to win the Premier Breeder Award this year and received the trophy in January 2011 at the Blue Show and Sale at Carlisle. 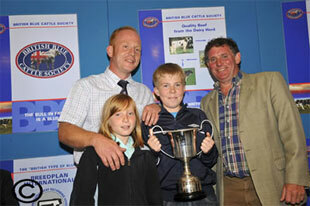 The trophy was presented for the herd prefix with most points at the shows. 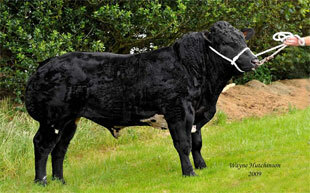 Thanks to those showing Solway View cattle this year. 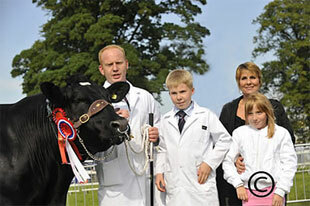 The inaugural Scottish Pedigree Calf Show saw SOLWAY VIEW FIRE CRACKER take Junior Champion honours. Sired by Gitan Du Pjit Mayeur and out of Annanwater Wispa, this yougn bull is showing promise. 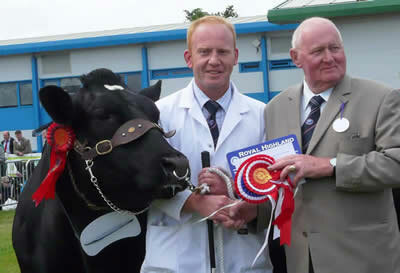 Solway View Elegance took top honours at the Border British Blue summer calf show held at Penrith show this July. 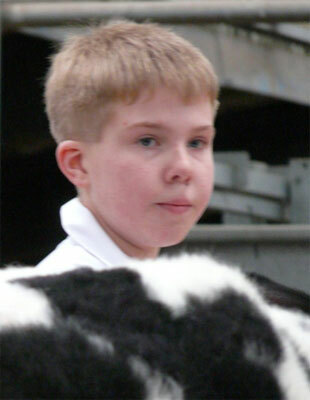 Ellis paraded this young heifer for Brain Wheatley who went on to make her his Champion. Congratulations to Dean Saunders who took Reserve Calf Show champion with his bull calf Maidenlands Fagan - this young bull shows great promise. Fagan is out of Solway View Cinderella by by Dartagnan Du Castillon . 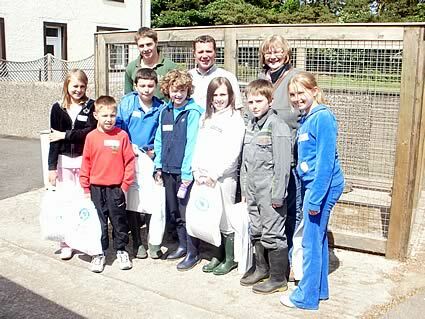 Primary 6 pupils from Cummertrees Primary enjoyed their Maths lesson more than normal when they visited Maulscastle farm to look at how mathematics comes into farming. 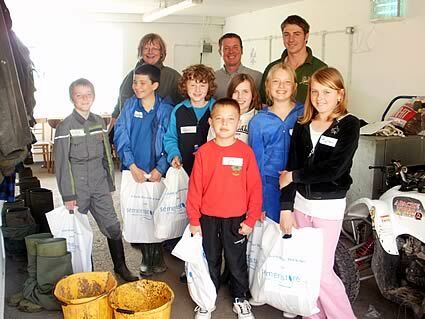 They were there at the invitation of Kevin Watret, who is one of the National Council members of the British Blue Cattle Society who were behind this initiative to introduce school pupils to practical applications for their mathematics curriculum. 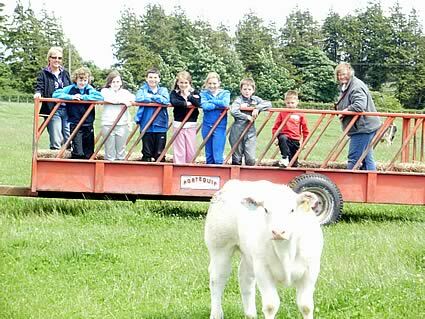 Each pupil chose a year old bull, which they will adopt for the next year and follow its progress through shows and sales. They will also track it through the ABRI Breedplan system, where they can find its breed history and look at how mathematics and computers allow pedigree farmers to assess the future potential of their breeding stock through Estimated Breeding Values (EBV’s). 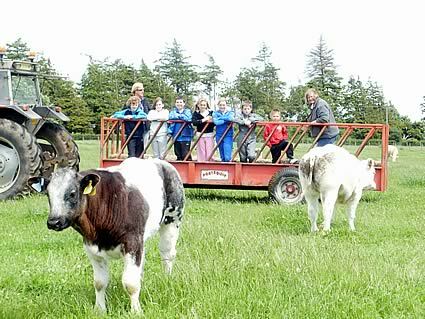 The pupils will follow their bull’s progress through the summer show and sale season and visit the farm again in late autumn when their bulls come inside to look at feeding ratios and the difference the seasons make. June 2009 we are pleased to announce the sale of Solway View Dynamite to FABROCA in Belgium. This young bull caught the eye of Benoir Cassart who was looking for British Blues with potential. The Border British Blue Club May show and sale saw a large entry and strong classes. The February 08 born heifer Balzer Dancing Queen caught the eye of judge David Ellis and fellow breeders Kevin Watret and Andy Ryder. 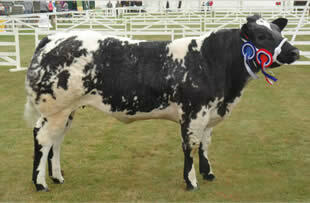 David Ellis stood her at the top of her class and Kevin and Andy jointly bought her for 7000gns. This heifer is currently in our flushing programme. 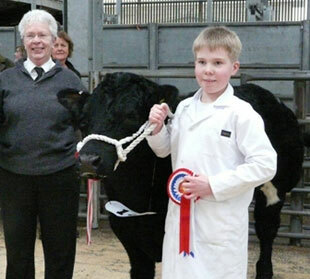 We were delighted to win two of the classes at the Border British Blue Club Calf Show with a heifer and a bull. 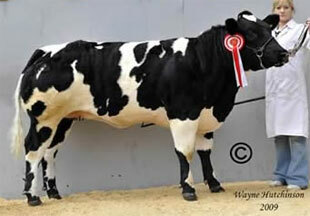 Solway View Dynamite ET is our Bringlee Sandy/Baron son born April 08. This was the first year that Connor has taken part and he led Dynamite to victory in his class. 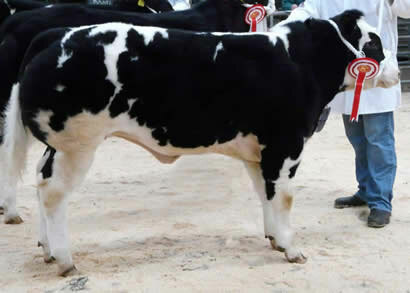 Winning the heifer class was Solway View Drambuie ET - a flashy show heifer out of Broomfield Vivien and by Empire D'Ochian. Drambuie went on to take Reserve Female Champion honours. 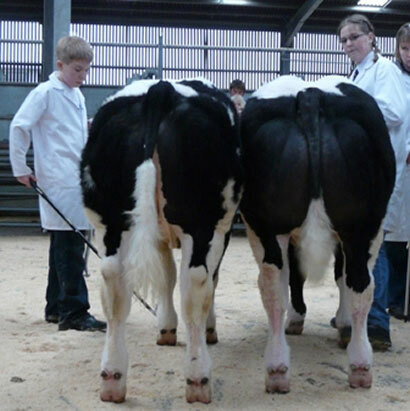 Sowlay View Drambuie teamed up with Parsonage Drew to win the Progeny Pairs. Both won their class and both were sired by the bull Empire D'Ochain. As you would expect from a Bringlee Sandy son, Solway View Caesar has great potential. 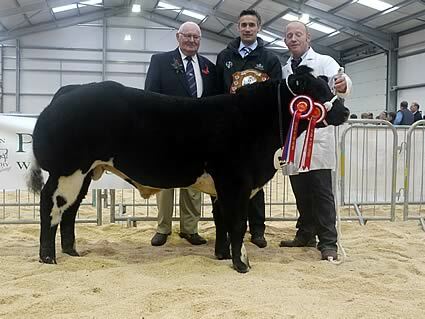 He and the rest of the Solway View Team travelled to Carlisle for Agri Expo where judge Brain Wheatley placed Solway Caesar at the head of his first class. Later on he went on to take Championship honours, fighting off stiff competition.